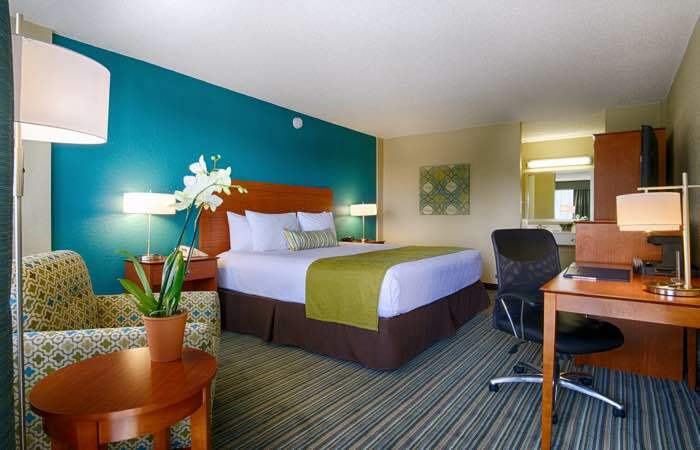 Featuring two wings united by a bayfront swimming pool, the Best Western on the Bay offers a variety of rooms to suit the needs of its business and leisure guests. Many rooms have private balconies overlooking Biscayne Bay and the option of interior and exterior corridors. Vending machines in both wings are well-stocked with soft drinks and snacks. Measuring 376 square feet, our non-smoking Standard Two Double guest room features a microwave, refrigerator, coffee maker, hair dryer, iron and ironing board, safe, flat-screen television and free WiFi access. These rooms are located on floors 2-5 of the West Building and offer either pool or downtown Miami views. 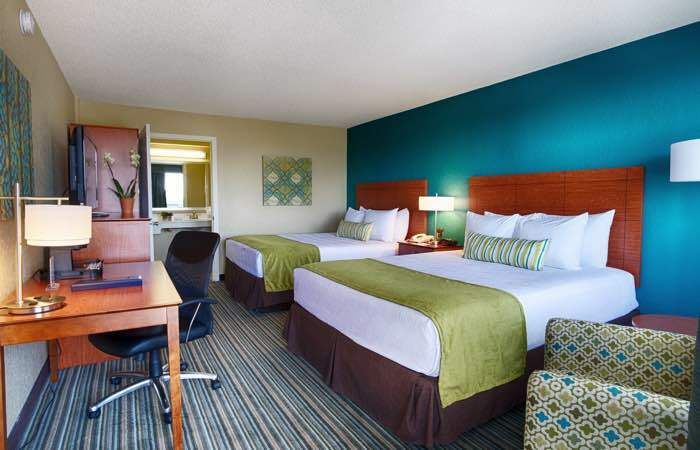 Our Standard King guest room is attractively furnished and features a microwave and refrigerator, coffeemaker, iron and ironing board, hair dryer, safe, flat- screen television and comfortable king bed, as well as a spacious, well-lit work area. These rooms are located on floors 2-5 of the West Building and offer views of either the swimming pool or downtown Miami. Spanning 327 square feet, our non-smoking Two Queen Sleeper Studio guest room features two queen beds, a queen sleeper sofa, and generous work desk with comfortable desk chair. Other highlights include a microwave, refrigerator, coffee maker, hair dryer, iron and ironing board, safe, flat-screen television and free WiFi access. Our attractively furnished, 247-square-foot Two Queen Balcony guest room features a private waterfront balcony and two queen beds. These rooms are located on the 3rd floor of the East Building and have a microwave, refrigerator, coffee maker, hair dryer, iron and ironing board, flat-screen TV and free WiFi access. A popular choice for couples, our non-smoking King Balcony guest room spans 227 to 247 square feet and is comfortably furnished with a king bed, flat-screen television with premium channels, work desk and chair, microwave and refrigerator. Other amenities include an in-room safe, coffee maker, hair dryer, iron and ironing board. Located on floors 2 and 3 of the East Building, these rooms have private balconies surrounded by coconut palms. Featuring a direct bayfront location, our Bayfront Balcony guest room is a non-smoking oasis with a comfortable king bed and an inviting private balcony perfect for watching the boats dock and the bustling activity at Shuckers just below. Measuring 312 square feet, this delightful room features a flat-screen television with premium channels, work desk and chair, microwave and refrigerator. Other amenities include an in-room safe, coffee maker, hair dryer, iron and ironing board. These rooms are located in our West Building on floors 3, 4 and 5.